Folks its that time again. Our annual duty to make sure you pay not ONE MORE DIME to a bloated government than necessary. Michigan business with $80,000 or less in fixtures, desks, computers etc., are STILL required EVERY YEAR to fill out the form to get their exemption. 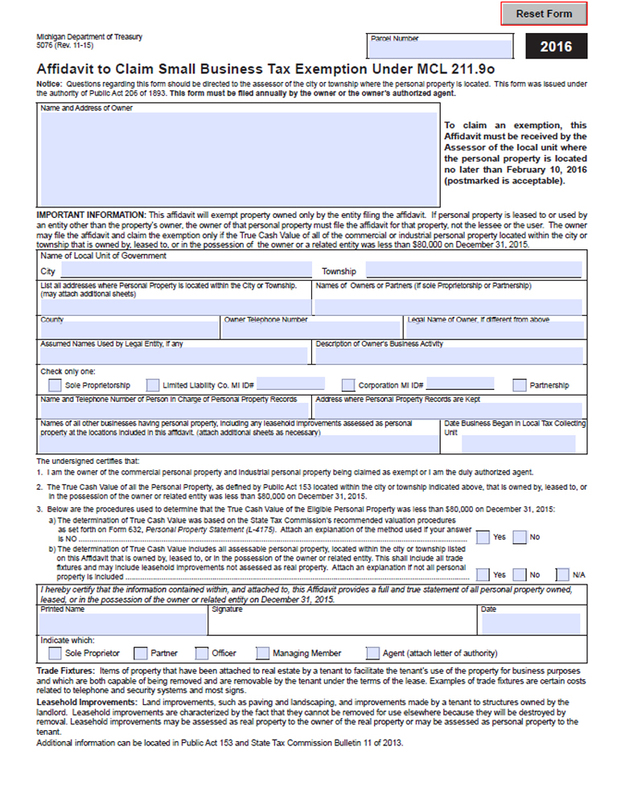 You must fill out the MI Treasury Form 5076 with your local assessing offices by Wednesday, Feb. 10, 2015. You can use the link to the affidavit form (once again) here. Fill it out and for best results deliver by hand to your assessing office ASAP. You have until February 10, 2016 to turn this in. Do not get this confused with the February 20th due date on PPT reporting of over $80K. Never, EVER, give em no more than is absolutely necessary.